- Two key pieces of evidence taken directly from the Gotham City Police Department crime lab. - Assassin\'s Intel Dossier, including files on the 8 assassins, as well as Black Mask\'s contract. - 1st Appearance Batman Skin: Look just like Batman did during his first appearance in Detective Comics No. 27, released in 1939. - Deathstroke Challenge Pack: Unlock the ability to play as one of the world\'s deadliest assassins! Usable throughout all the Arkham Origins Challenge maps. Also includes two bonus challenge maps and two bonus Deathstroke Skins. 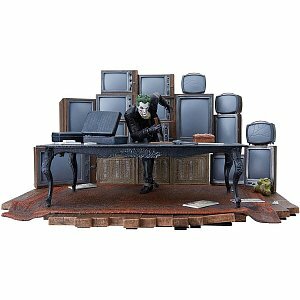 - The \'\'Necessary Evil: Super-Villains of DC Comics\'\' feature-length documentary from Warner Bros Home Entertainment that focuses on DC Comics\' villains - including the Joker, Lex Luthor, Bane, Black Adam, Black Manta, Catwoman, Darkseid, Deathstroke, Doomsday, General Zod, Sinestro, and the Suicide Squad - that Christopher Lee narrates. Directors Richard Donner, Guillermo del Toro and Zack Snyder, as well as DC\'s chief creative officer Geoff Johns are featured in the film. 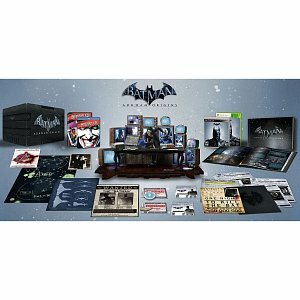 Batman: Arkham Origins videogame is not included with this collector\'s set - sold separately. Další z "Sochy v životní velikosti"